Anti dust mite treatment: Rest easy! Dust mites are microscopic spiders who get stuck in hot and wet areas and produce a huge quantity of dejections that can cause allergic reactions. Our anti dust mite treatment protects your duvets, sheets, pillows, curtains, etc, against dust mite infestation for 6 months. 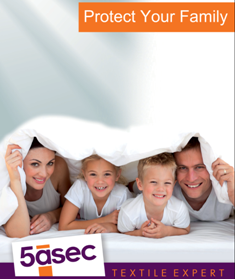 Since 1968, 5àsec takes care of your clothes and house linen. As a world leader we commits to offer you the best quality for your garments and textile. Our shops offer a wide range of services to take care of your textiles (a specific treatment for your delicate clothes with Maxima, finishing treatment to protect and maintain your clothes, waterproofing, dustmite repellent, alteration service etc. ).